By Bob Odenkirk, David Cross, and Brian Posehn. Welcome to our new book review column here on Ground Control called “I Wanna be Literated”! We are going to try and keep this column up with not-just music related and not just brand new books. Some will be topical, old, some new, some borrowed, and almost all of them blue. We are proud to start you off with a humdinger, and hope you keep coming back. After all, Punk’s Not Read. Sometimes the line between content and bonus feature gets blurred a bit. For having such a short run, Mr. Show is arguably the greatest comedy sketch show there ever was. It was funny, edgy, and smart, and lucky for us, the DVDs will always be there for us to watch. The cast is so funny that even the audio commentary on all the episodes can stand on their own. It’s been 18 years now and we are blessed with a Mr. Show reunion of some sort. 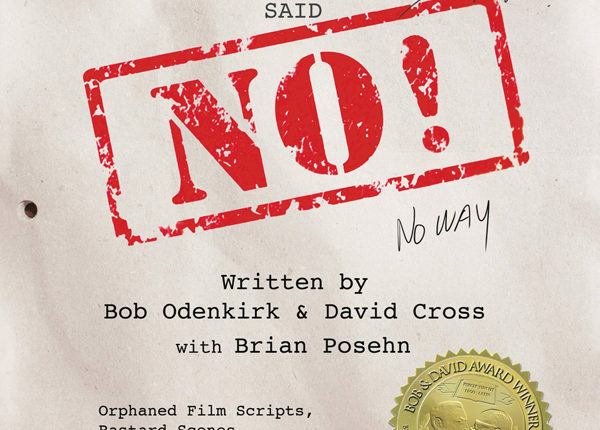 David Cross, Bob Odenkirk, and Brian Posehn are on the road doing sketches, standup, and promoting this book of scripts called “Hollywood Said No!” which as the title says, has a bunch of scripts for movies and sketches that never got made. And how does it hold up? Surprisingly well, and especially if you use your imagination a bit. Here we have two movies, “Bob and David Make a Movie” and “Hooray for America” in their entirety and after getting the hang of script-reading, one can imagine these scenes being performed as regular Mr. Show sketches (especially Bob and David Make a Movie which plays like a long Mr. Show episode). And just like Mr. Show, the quality is there in almost every page. Both movies are filled with witty dialogue (Bob playing the almost-straight man in all their conversations), hilarious Mr. Show-esque situations and pacing, and deal with smart topics. The results are pretty fantastic, and one wonders why these movies never got picked up over the years. It’s the perfect companion for any fans of the show, or honestly, if you want to see how comedy can still be fresh and relevant. And it’s painful to read through the short sketches at the end since they are perfect for TV right now! There’s no question – these idea and sketches are great. The only question now is only why isn’t there a Kickstarter for these scripts?